This is an amazingly quick and easy vegan sour cream recipe. It’s great as a dip for parties. It’s also a nice topping to keep on hand to add zing to your potatoes or beans. You can also try swapping out the dill with your other favorite herbs. Remember: 1 Tablespoon fresh = 1 teaspoon dried. You may need to add more or less to taste. Place all ingredients in your Vita-Mix or food processor and blend until smooth. Store in fridge. Will last for up to 4 days. 1. You may need to add more or less water depending on the strength of your equipment. 2. If you're using the Vita-Mix profressional series, use the "frozen dessert" setting and use the tamper throughout the processing. 3. You may prefer to soak the cashews prior to processing. I do not do this, but it is said that soaking the cashews will make them easier to digest. If you prefer to soak your nuts, the recommended soak time is 1-2 hours. 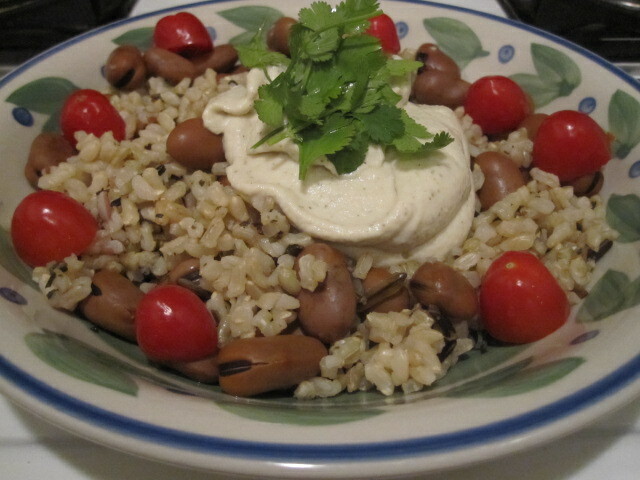 Let us know what you think of this easy vegan recipe: Dill Sour Cream! I think you meant to say 1Tbsp. fresh herbs = 1tsp. dried. I also think the recipe may need to be modified — the herbs quantities seem to be reversed.